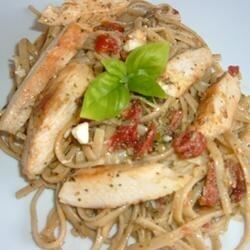 "A great Italian dish; easy to make, pleasing all the pasta lovers in my family. Serve with a Caesar salad, garlic bread and a nice red wine." This was very good. I didn't add all the oil that was called for because it seemed like a lot. But that ended up being a mistake cause it was a bit dry. cut way back on the oil as some suggested. Husband thought black olives would have been a good addition. I would definitely recommend cutting the oil back to about 1/3 cup and subbing in sun-dried tomato pesto for a smoother sauce.